QuestionIs a gun-firing drone legal under the Second Amendment? Did you see that civilian-grade drone equipped with a semi-automatic handgun that was being fired remotely? We asked the experts if it was legal. Last week, a video was uploaded to YouTube showing a civilian grade drone equipped with a semi-automatic handgun that was being fired remotely somewhere in the US. We know that guns are legal (to a degree). We know that drones are legal (depending on the sort). But are gun-toting drones legal? 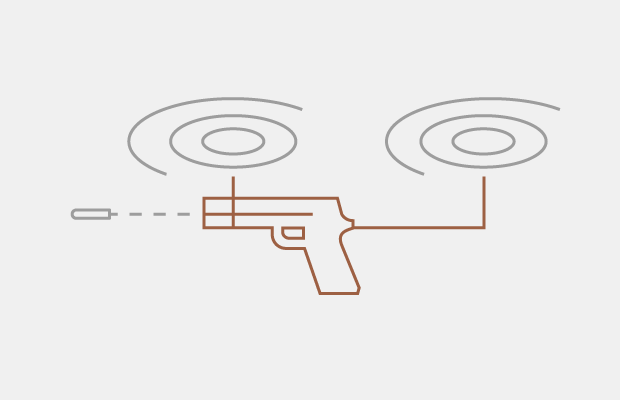 We asked the US Federal Aviation Administration and several legal experts on the Second Amendment and civilian drone ("Small Unmanned Aircraft Systems") policy whether attaching a gun to a drone and shooting it would be legal. Though the gun experts disagreed on the degree of this stunt's legality, they did mostly think it was "stupid" to "play" with "toys" and firearms like that. It's hard to defend, with the Second Amendment, someone bearing arms remotely. Because with any type of weapon—whether a revolver or a semi-automatic pistol—it's not going to be able to chamber a round on its own. That's as stupid as loading a gun, getting it ready to fire, and handing it to your dog. Drones crash all the time. You can't defend under the Second Amendment, pointing a gun at somebody without good cause, which would be self-defense. The drone has no right to self-defense. It's an object. You can't even arm your drone so that it doesn't get stolen. It's a frivolous argument to say your drone has a right to self-defense. You can't really, with a straight face, argue that you have a fundamental liberty interest in arming a drone. "Drone" as a category refers to any unmanned, remotely piloted flying craft, ranging from something as small as a radio-controlled toy helicopter to the 32,000-pound, $104 million Global Hawk. This language is problematic because it makes no distinction between military drones used in destructive war operations abroad and the Small Unmanned Aircrafts that are, essentially, high tech toys. And sometimes, great camera assistants. Or, package delivery gadgets. They can also deliver medicine, meth and... relatively harmless political messages. I saw the video but didn't pay much attention to it because I was so focused on the Chattanooga tragedy that happened yesterday. I just kind of said, 'oh ok', and put it on the back burner. But I think it was just some goofball playing around with a drone—some goofball playing with a toy he's got. But I'm not sure any law has been violated. If the FAA [Federal Aviation Administration] says that this is a prohibited activity. Because this guy put this on YouTube, he could wind up in trouble. It reminds everybody to be really careful about what you put out in public. I see monumentally stupid stuff on YouTube. Putting a firearm on a drone and coming up with some sort of technology that allows you to radio-control fire that gun is, I think, questionable, at least at this point. Unless he's trying to peddle this technology to the military or something. I suppose if somebody gets prosecuted over this, I can envision them trying to make a defense. I'm not sure how far that would go with a jury. You can can sue a door knob if you want to, but that doesn't mean you can win. People who do things always try to come up with some defense when they get in trouble. The FAA will investigate the operation of an unmanned aircraft system in a Connecticut park to determine if any Federal Aviation Regulations were violated. The FAA will also work with its law enforcement partners to determine if there were any violations of criminal statutes. It is contrary to FAA regulations. Potentially an NFA [National Firearms Act] violation as an untaxed Any Other Weapon as well. There's a case to be made that when firing indiscriminately. This is certainly true when say someone comes out on the 4th of July and decides to shoot their gun up into the air. In Philadelphia where I work, that would get you arrested and charged with, at the very least, recklessly endangering others. What's going to determine what kind of potential violations there are, are all in the details. Where is this happening? Was this on a gun range in a certified setting? Or was this just some yahoo who had two toys he wanted to play with and decided that, like chocolate in peanut butter, they'd go great together. Part of the issue here is going to be what state are you're in. Different states have different laws with the regards to the regulations of firearms in addition to the federal ones they're under. But when it comes to the issue of shooting a gun, it really comes down to the circumstances - where it's happening, under what conditions it's happening. If they're at a gun range and they decided to hook it to a drone, you're probably not looking at anything. Or if you're out in a place where it's perfectly legal. I've dealt with cases where someone thought it'd be a good idea to test out their brand new gun by shooting it under a highway underpass. Clearly that's illegal. Based on solely what you're describing with the YouTube video, the best answer I can give is, I don't entirely know. There would need to be more information that would need to be given. But I can say firing a gun indiscriminately has been chargeable as an offense in certain circumstances.